Chaim Silberstein also reported that a few hours, B”H, Shira was transferred out of the ICU. Though her doctors are warning that she still has a long recuperation ahead of her. Please continue praying for a complete recovery for Shira Yael bat Liora Sara. A nurse at Shaarei Tsedek has offered to bring your blessings for the Ish Ran and Silberstein families directly to Shira Ish-Ran tomorrow morning (Friday). The deadline to leave blessings in the comments for her and the families is today (Thursday) at 8 PM (Israel)/1 PM EST. 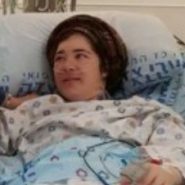 Baruch Hashem that you’re out of the ICU, Shira! I’m so sorry for all that you and Amichai have suffered. I bless you to have many more healthy and happy children! If you ever come to Tzfat, stop by Tree of Life vegetarian restaurant for a free meal! You are the face of our people, of Am Yisrael now. When we learned Megillat Esther together, you told me how Hshem prepares the remedy before he send the affliction. Seeing now your words and your promise to have many more children after you met your baby, it’s so clear He has indeed prepared the remedy for you. Thinking of you constantly and davening for you from none other than the siddur you gave me. B’ezrat Hshem we will see each other soon. I have you in mind for our concert this motzei Shabbat. Mr. and Mrs. Silberstein, your whole family is in my prayers and the prayers of my community in the US. Thank you for your strength and example. Last Friday morning I walked into your hospital room in Shaare Tzedek where my husband Shmuel was being treated for the last week. I wanted to give you something, but when I finally was able to see you, with all your siblings crowded around you, it took a few minutes to ask them to move a little…I became so overcome with emotions, that it was hard for me to find the words. In my handbag was a white and also a pink hair ribbons for your baby girl.. but my hands could not pick them up, let alone hand them to you. So do not forget I have some beautiful ribbons and flowers for your little girl which I would like to get to you. You will have babies, healthy beautiful babies but you will never forget your first child ever but it will not hurt anymore. Shmuel Ben David also wants you to know that as he loves to give blessings he is sending you and your husband, all the blessings for your speedy recovery and health and happiness. We are with you in your suffering, Shira! Just know that your positivity and emunah is strengthening Jews all around the world! You are unbelievable!! May you have a quick, easy, and complete recovery beezrat Hashem!!! We pray for you and send many blessings full of hope for you and your dear husband.